Julian Rocks Marine Reserve, Byron Bay, NSW. Best scuba diving and snorkelling location in New South Wales, Australia. Cape Byron Marine Park, top dive spots. Please note: Under the Fisheries and Oyster Farms (Julian Rocks Aquatic Reserve) Regulation; disturbing, injuring or removal of all forms of marine fauna within a 500 meter radius of the reserve is prohibited. Underwater photography © Tim Hochgrebe. According to a story from the Bundjalung people, a jealous husband threw his spear at the canoe of his wife and her lover. The canoe broke in two and sank to the bottom of the ocean. Only the back and the front of the boat stuck out of the water, creating a rock formation 2.5 km off shore. With the two main peaks named after his nephew and niece (Juan and Julia) by Captain Cook when he sailed by in 1776, Julian Rocks consists of ancient volcanic rock*, remains of an eruption more than 20 million years ago. Established as a marine reserve in 1982 after 10 years of lobbying by local users, Julian Rocks is one of Australia's top dive spots, and forms a most unique marine reserve, providing shelter and food for more than 500 tropical and temperate fish species. Not only does Julian Rocks provide resting and nesting grounds for many seabirds, such as seagulls and cormorants, underneath the water is an invisible world with abundant marine life present. With water temperatures and currents changing throughout the year there are many seasonal visitors. 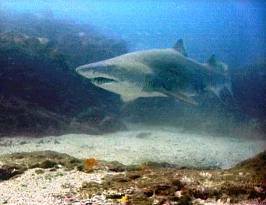 The grey nurse sharks come to Julian Rocks during the winter months, presumably to breed. Although these sharks look ferocious with their mouths slightly opened and their teeth sticking out, it is perfectly safe to dive with them. In spring the blue tang pays Julian Rocks a visit. This is a fish which can be easily distinguished by its blue body and bright yellow tail. Schools of big-eye trevally are most common in summer. 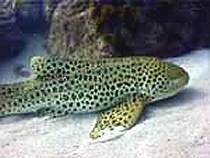 The docile leopard sharks can be seen on almost every dive during mid-summer when the waters are warmest. The spotted patterns on their skin gives them their name. Most of the time they lie resting on the sand, but if you are lucky you can see them swimming, moving their long tail slowly. In summer and early autumn manta rays cruise elegantly through the waters surrounding the rock. Sometimes feeding and definitely curious they are fantastic to encounter. And then there are of course the ‘regulars’ like different species of wobbegong sharks, turtles, cuttlefish, schools of white spotted eagle rays, egg-cowry shells, moray eels, banner fish, giant guitar fish and shovel-nose rays. 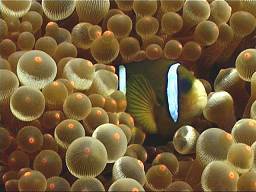 Sometimes there are so many fish around, you can hardly see where you are going. Not to mention all sessile animals (attached to substrate) like tunicates, colourful sponges, both hard and soft corals, giving you the feeling you are floating through some beautifully landscaped underwater garden. The interaction of tropical and temperate species makes every dive an exhilarating adventure. The three minute boat trip to the rock is almost as exciting: surfing the waves sometimes accompanied by playful dolphins. From May till September the Humpback whales come past Byron Bay and can easily be spotted from the boat. With water temperatures up to 25 degrees Celsius and visibility of 20 meters at most times there is really nothing to complain about. Fortunately the dive operators in Byron Bay also realise the value of this Aquatic Reserve. Moorings have been put in place and are taken care of, so destructive anchors are not needed. And since there are only a limited number of commercial vessel launching licences available, no over-diving can take place. All different dive sites around Julian Rocks are equally impressive and offer dives that are spectacular for the novice and the very experienced underwater explorer! Tim originates from Germany where he finished his Biology degree BSc (Hons) before moving to Australia to complete his science education with a PhD (Sydney University). He has been a keen diver and marine biology enthusiast for more than 13 years, and spent over three years as President of Sydney University Underwater Club. Wandy has been diving for many years, and nothing escapes her carefully observing eyes underwater (or above water). She can talk about marine life for hours and is also a fantastic cook. Together they have created Planula Diver's Retreat, a B&B specialising in dive accommodation packages with a difference. With their slogan - "The more you know, the more you see! ", Wandy and Tim guide dives and point out behaviour of marine life such as mating rituals or defending territory, showing eggs of different life forms and explaining general biology. * Ancient Volcanic Rock; Described as Meta sediments of the Neranleigh-Fernvale beds, from; "Tweed Volcanic Region, 360 million years ago to the present day. 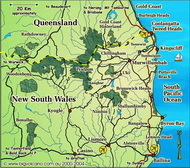 An Environmental History of the Beaudesert, Gold Coast, Tweed, Brunswick and Richmond Region" v1, 2001. Compiled by (the late) Bruce Graham.